B Infinite Crazy Mark Down! 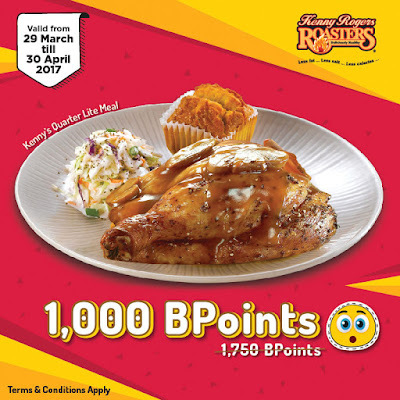 Flash this e-voucher to enjoy Kenny's 1/4 Lite Meal @ 1,000 BPoints! Applicable for ALL KRR Card / KRR BCard/ BCard/ B Infinite Card/ B Infinite virtual card. Member must present the physical KRR Card / KRR BCard/ BCard/ B Infinite Card/ B Infinite virtual card to KRR's cashier to redeem the BPoints. PIN is required upon redemption. 1,000 BPoint is required for every Kenny's Quarter Lite Meal redemption, no partial point redemption is allowed. Not valid with other offers/ promotions/ discounts. Discounted item is non exchangeable and cannot be redeemed for cash.